Since I wrote this three years ago, there has been an increased awareness of equine neuro-muscular disorders by horse owners and their veterinarians. 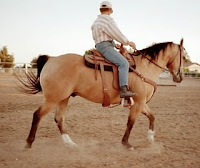 Draft-crosses are becoming popular - spurred by PMU mare/foal rescues many are being ridden by new or first-time horse owners - and their susceptibility to "traditional" draft horse neuro-muscular issues often forces their owners into a sharp learning curve. To most horse lovers, Parfum de Pommes Cheval is part of the stable lifestyle. But what happens when those fragrant horse apples turn into poo soup? 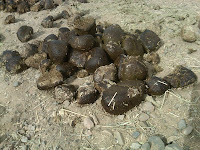 Diarrhea in our horse is an indication that all is not well in his digestive tract and can have serious consequences. It may quickly lead to dehydration which can be a primary cause of colic. It's important to determine the cause but, while we're figuring this out, there are some steps we should take to avoid more serious problems. Monitor your horse's water intake. If you use an automatic waterer, turn it off and provide water in a large container (tub, tank or large, clean trash barrel). Make sure your horse will drink from this source. Provide a second bucket of water that has some salt added - a small handful of plain salt in a 3-gallon bucket is about right. Provide wet feed such as a beet pulp slurry or add water to his usual concentrate to make a wet mash. A benefit of beet pulp is it will also act as a "pre-biotic". Feed hay wet - either spray with water or dunk in a bucket. Watch that your horse is actually swallowing his water and mash - not just playing with it. Some illnesses can cause paralysis of the esophagus and prevent swallowing. He has a temperature above 102F (or 1 degree above his "normal" temperature). Your horse seems dehydrated. Do a skin pinch test on the shoulder or neck - the tented skin should immediately snap back with no "wrinkles". Check his gums - they should be a healthy pink; press on the gum until it's blanched (white) - it should become pink again in less than 3 seconds. His resting heart rate is higher than normal (in the 30's or low 40's). You should have a record of his normal heart rate from doing "well horse checks" when your horse is healthy. Your horse seems depressed - standing with his head in a corner, not respon ding like he normally does or ignoring his surroundings. The diarrhea has a foul odor - not the normal fragrance of manure - or you can see blood or mucous. He acts like his tummy hurts - looking at or biting his sides, pacing, anxious look on his face. If your horse is otherwise bright and healthy appearing and is eating and drinking normally, it may be safe to wait and watch a day or so to see if the diarrhea resolves on its own - like the "nervous squirts" many horses will have when trailering or after being moved to a new place. But if your horse seems off, it doesn't hurt to at least give your veterinarian a heads up - you and your vet may decide that some extra fluids (by IV or tube) might be appropriate to avert an emergency in the middle of the night. With an acute, or sudden onset of diarrhea, trying to slow down or stop it is not always the best route. Diarrhea is one of the ways the body has to rid itself of pathogens in the GI tract. Some pathogens create toxins that can damage the intestines - if the body is kept from eliminating them the pathogens can multiply and continue to create toxins. "C. diff" (Clostridium difficile) is one example - this can cause painful cramps and serious damage to the intestines and requires antibiotics to resolve - your vet is likely to order stool cultures to determine the best treatment. Evaluate your horse's diet for adequate forage (1.5 to 2% or more of body weight) and concentrates that may provide excess sugar or starch. Provide smaller, more frequent concentrate meals to lower the chance of undigested sugars getting past the cecum and small intestine to the hind gut. 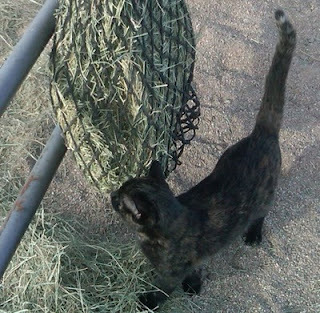 Examine your hay and feed for mold, insects or rodent droppings. If hay is of questionable quality, it can be tested for mycotoxins - see Equi-Analytical's web site. Add a pre-biotic or pro-biotic - such as Ration Plus, S. cerevisiae yeast, Forco or other quality product to your horse's ration. Pro-biotics in a feed or supplement may not be included in sufficient quantity to be effective in establishing adequate gut microbes. Beet pulp also acts as a "pre-biotic" - helping set up favorable conditions in the gut to encourage the "good" bugs to grow. Many people have reported success using human "over the counter" remedies to sooth and protect the GI tract. These include aloe vera juice, simethicone or antacids containing simethicone and kaolin/pectin (also available as a large animal preparation at some feed stores). As a rule of thumb, an equine dose is about four to six times the human dose - think "weight based" and consult your vet. There are also many products now targeted to the equine GI tract. Dr. Eleanor Kellon's Horse Journal Guide to Equine Supplements and Nutraceuticals has a complete section on Digestive Tract Aids. Ensure your horse is receiving adequate salt in his ration. Inadequate salt may lead to chronic dehydration at the cellular level which can affect all bodily functions. Horses are unable to get enough salt from a salt or mineral block. One to two ounces (approximately one to two heaping Tablespoons) of regular table salt is about right for an "average" size horse at maintenance. Evaluate your horse's deworming program, especially if his exposure risk has changed. "Natural" dewormers have not been shown to be effective and horses with lowered immune system defenses (including from age) are more susceptible to problems from parasites. Don't give commercial electrolytes to a dehydrated horse - this can worsen any problems he may be having. A second bucket of water containing some salt can be offered and may encourage drinking but only if plain water is also available. Your veterinarian may want to give electrolytes in IV fluid but she will also ensure that adequate plain fluid (normal saline IV or plain water via stomach tube) is also given. Most diarrhea in horses will resolve fairly quickly, but keep a sharp watch for dehydration or other signs that you need to call your vet. I don't often reply/post on many of the on-line groups I'm subscribed to as I'm not often able to get back to follow-up. But recent discussions on "allergies" and herbal remedies (for "allergy" and other inflammatory conditions) on the EC/IR group and other groups caught my attention. magnesium and Singulair (which is very similar to Spirulina in the way it acts), staying hydrated, getting enough rest, eating a balanced diet. If I do all these things I can stay off the inhaled steroids. In fact when I really pay attention to what I eat and drink and get enough rest I can actually pet and play with the barn kitties without turning into a mass of itchy red eyed sniffles. Flax, spirulina, chondroitin etc (in addition to the baseline mineral balanced diet) all help improve the inflammatory threshold so the horse doesn't respond to triggers by mounting a major inflammatory response. But once an inflammatory cascade is started it seems more and more things will act as triggers until our horse is in a bubble of inflammation - with many systems affected. It can take something fairly significant (such as steroids and antihistamines) in large enough doses taken for a long enough period of time to stop the inflammatory response spiral and hold it off long enough for the immune system to regroup. I think this is why some of these herbal concoctions are successful - if you put a large enough variety of herbal ingredients with anti-inflammatory properties in a high enough potency to stop the inflammatory cascade plus some adaptogens to help improve circulation, etc., something's bound to work. The "proprietary blend" or, IMO, "kitchen sink" approach. If someone uses one of these blends and it works, the cost and accompanying rhetoric is irrelevant and we become a fan. Few of us actually take the time to figure out what made it work. If it doesn't work, we tend to just walk away and start searching for something else - we rarely go somewhere to discuss the downside - that it may have gotten in the way of appropriate diagnosis and resulted in the wrong treatment for the wrong thing. Knowing and understanding what you're giving your horse; what it is and what is it meant to do. Being responsible for what gets put in your horse's body. Understanding that any herb or homeopathic that is potent enough to effect change is potent enough to possibly produce side effects or toxicity, the same as any other "medicine". Understanding that "natural" does not equal "safe". When you give "kitchen sink" mixtures, you have no idea what worked and what didn't. If it looks like magic, there's probably some sleight of hand involved, especially if it costs a lot (this is my personal opinion). Any medications - western, non-traditional, herbal, energy modalities, etc. need to be administered after a sound nutritional base is established; often the appropriate balanced nutrition provides a sound base and some conditions that previously required medication are eliminated. It's necessary for the EC main list to remain tightly focused so in depth discussions that aren't directly related to EC/IR are referred to EC Horsekeeping - that doesn't mean they are "anti-xyz", just that it may be distracting for many newcomers. There are a lot of herbal resources on-line and in bookstores - where you can look up an herb, see its properties and what it's expected to do and determine if this is something appropriate for your horse. You don't need a pharmacy or medical degree to decide if you want or need to give your horse something that will cause him to pee more or make his liver work harder or if a mild anti-inflammatory will make him more comfortable after work - many of these decisions are simply common sense; you may want some guidance to determine if you want to give your horse an immune stimulant or something that supports his immune system (a vast difference). If you really want to get a handle on changing the course of the inflammatory cycle, check out Dr. Kellon's Nutrition as Therapy course. From Fran Jurga`s Hoof Blog: Up-to-the Minute News from Hoofcare & Lameness Journal: Equine Pituitary Dysfunction Test Choices Analyzed...: "In our new age of horses as companion animals, a significant proportion of our equine population would be considered into or at least approaching the geriatric phase of life. 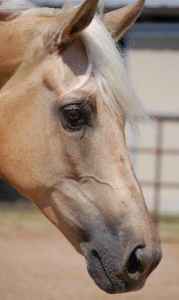 Equine pituitary disease and disorders are a concern in the horse-owning public..."
Because it is a late sign, laminitis is a poor "diagnostic" indicator for PPID (Cushing's disease). Testing ACTH (with Cornell as our lab of choice), despite the difficulties in handling and shipping and the possibility of false negatives or positives is immensely better than waiting until your horse has laminitis or has foundered. It's always good news when our knowledge base about diagnosing this disease is broadened or - as here - confirmed. I trim 2 horses, same place, same feeds, 3-4 year age difference, both QH, both on 5oz AZ Copper Complete. Then [someone] gave her a sample of something called hoof armour or something like that - it is a yeast supplement for feet, very expensive. Have you heard of it? Anyway, she put the one horse on it and did not put the other horse on it. I went back to trim and the horse on it had zero separation and foot looked good overall, the other one looked horrible, had terrible separation and just overall not good. I had briefly looked at Kombat Boots some time ago and felt that, given the cost, I would just try HorseTech's Yeast+. I took a closer look at it this morning, and also some other things I feel might affect hoof quality, especially in an older horse. Kombat Boots appears to me to be an expensive version of saccharomyces cerevisiae yeast. http://www.kombatboots.com/. Based on the information on their web site I don't see any advantage for this product over basic Diamond V http://www.diamondv.com/products-core/ or Yea-Sacc http://www.yea-sacc1026.com/yea-sacc/about.htm. I've been using Yeast+ from HorseTech (which is Saccharomyces cerevisiae yeast from Diamond V) http://www.horsetech.com/yeast.htm. You can order bulk bags of Diamond V yeast at some feed stores or from here http://triangleh.com/category/diamond-v-yeast-order/ (I've never ordered here so don't know the level of service). If you do a comparison, Kombat Boots claims "100 grams of natural yeast in an 8 oz. serving". This is about 12.5 grams per ounce so I presume there is some kind of filler to make it pelleted. HorseTech's Yeast+ is 28 grams of yeast per ounce or 227 grams in 8 ounces. No filler. Same for basic Yea-Sacc or Diamond V.
Kombat Boots' web site says "other" products "...use yeast cultures, yeast extracts..." implying they don't actually contain yeast. The products I looked at above do contain "Saccharomyces cerevisiae yeast..." or "Saccharomyces cerevisiae yeast and the media on which it was grown..." - this certainly indicates that these products do contain yeast. I don't know how yeast might be grown except on a culture medium of some type so any yeast might be considered a "culture", even if it is removed from the growth media. Saccharomyces cerevisiae yeast will act as a probiotic and to help older horses (and younger stressed horses) with B-vitamin support, and is thought to help with utilization of feeds - improved fiber digestion in horses hasn't been scientifically proven but is claimed in other species and in horses anecdotally. Another thing I'd look at for an older horse (or any horse with hoof problems) is the crude protein (CP) and digestibility (ADF, NDF) of their hay, and if the energy level (DE) is sufficient to keep protein from being diverted to energy use. If the hay is not really good, even extra amino acids (AA's) in the supplement might not be enough. Horse's digestive systems weren't really meant to support horses living this long (how many horses over twenty or twenty-five survive in the wild?) - some that aren't doing well on the "basics" may need a boost. Protein sources that also contain moderate levels of fat can be useful, keeping in mind that high fat levels can worsen or induce insulin resistance (IR). pelleted hay (this is why my aged black Appendix mare is getting close to 8-9 lbs alfalfa/Timothy pellets + beet pulp daily, along with her AZ Copper Complete supplement and Yeast+). Plain or mixed pellets from Mtn Sunrise, or Lakin or other mixed pellets can make up 100% of the ration, with hay provided for "entertainment". This might really be the first place to look for an older horse - it's worth trying a pelleted hay for a few weeks to see if it makes a difference. Soy is a fairly complete protein plus it's cheap - thus its popularity in feeds. Soybean hulls may provide lower lysine content or its lysine availability may depend on what's combined with them. Calf Manna is an example of a high soy protein feed (but also contains corn which can make it unsuitable for an IR horse). None of the others are "complete" proteins by themselves but, used in combination, can provide a more complete AA profile. Moorman's MoorGlo has rice bran, flaxseed and "SoyShine" lipids plus some alfalfa meal and is very palatable. Nutrena Empower is a similar product. Both are high fat (18-22%) so should not be fed in large quantities. Whey protein isolate has a complete amino acid profile; most products (human sports/protein drink powders) provide about 24 grams protein in 1 ounce - or 96 grams in 4 oz. This is highly digestible protein (vs crude protein); does not add a lot of calories or sugars and would be one of my top choices for an IR horse or other horses where we want to limit sugar/starch. It's easy to add a scoop or two to feed twice a day. I tend to stick with vanilla - your horse may prefer other flavors. Whey (not the isolate) is a common ingredient in many feeds; it will have higher sugar levels and lower protein levels than the isolate. Make sure the product is pure whey - some protein powders also contain egg or soy protein. So, going back to Kombat Boots, we have another "magic bullet" - an expensive product that appears to be the missing ingredient in our horses' lives. Can it help? - probably. Would it be so effective if protein, energy, vitamins or minerals were missing from our horses' ration? - probably not. Is it worth the cost? Well, until they show me in true scientific terms - double blind crossover studies comparing Kombat Boots to basic Saccharomyces cerevisiae yeast, I'll stick with my Yeast+ from HorseTech. Boarding your horse always makes controlling your horse’s diet harder but many have found ways to work beet pulp into the routine. See the Beet Pulp articles for more information about beet pulp. Follow the same general guidelines if using hay pellets instead of beet pulp. If you can get to the barn daily, soak the beet pulp at home or at work or during your drive (a small cooler can work well for soaking and transporting). You can soak your beet pulp once a week or so and keep it in baggies in your freezer, ready for a quick grab on your way out the door. While “soak/drain/rinse” is ideal to remove surface iron, dust and residual sugar, the draining/rinsing could be skipped if your beet pulp is unmolassed and relatively dust free and no refrigerator is available. In this case, make sure you have figured out how much water needs to be added and supply a cup that holds that much (or mark your bucket with a water line). If the barn owner is willing to help, make it easy for them. Pre-measure the beet pulp and your supplements into baggies, provide a large closed bucket or other container to keep your stuff neat and together. If needed, provide the bucket for soaking/feeding, a colander for draining (this can be skipped), a large cup for measuring water (like a plastic soda cup) and a metal sweat scraper for stirring. And be willing to offer paying a bit extra for this service - especially if the BO will drain and rinse your beet pulp. Another detail - many barns in my area employ workers who do not speak English well. A clear way to show how to mix the supplement would be to pack a large "baggie" with the beet pulp and/or hay pellets, put your supplement in a smaller baggie - then put the smaller bag inside the larger bag. Put this into your mixing/feeding bucket along with the "stirrer" (metal sweat scraper or a large stirring spoon) and water measure cup. They will get the "picture" and the supplements won't get left sitting on the side. You can mark each large bag with the day of the week in the workers' base language. A table of days of the week in many languages can be found in Wikipedia. If you split feedings, make sure the bags are also marked morning/night - and you might add a sun/moon. Don't expect the barn owner or workers to measure or scoop. Do check that your horse is eating his feed; if the barn staff cleans feeders regularly you might not see left over feed, likewise if another horse has access to the feeder. If you find feed left over, try using more/less water or add herbs or other "taste tempters". See Witcheylady Potions for flavor ideas. Beet pulp is not “necessary” but is a low sugar/low starch alternative to bagged feeds and grain or can be used as a substitute for some of the hay ration (especially if you need to replace some high sugar/starch hay) and is well accepted by most horses. It doesn’t take long to get into a routine and the benefits usually outweigh any inconvenience. If beet pulp is not available, you can use plain hay pellets (I like the Mountain Sunrise Timothy or Bermuda pellets, or Timothy/Alfalfa pellets for hard keepers) as a carrier for your supplements. Donitilla is a beautiful well bred mare she has been used for a broodmare only.She is a daughter of RDS Me LLamo Peru++ Double HNS Domingo She is bred as good as it gets. She is due to foal next month . I am giving her away provided i get the foal back and get one more foal back next spring. She must go to a good home only. Let's see - I want you to pay the foaling costs, support this mare during lactation, put up with her being rebred, have all the care, cost and worry of taking her through another pregnancy and give me that baby too. For all this, I will give you a lovely pasture ornament. Who has only been used as a broodmare - and that's because...? maybe no one had time to train her but they'll have time for two babies? And she's being given away because...? Is broodmare a euphemism for something else? The original DSLD/ESPA INFORMATION site is continually updated with the latest research developments and ongoing support is provided by members of the DSLD-equine DSLD/ESPA Information and Management group. In early May, I was introduced by a Veterinarian to Steadfast, by Arenus. He offered me a 30 day money back guarantee to try it on my horse's DSLD. It costs about $2. per day. My horse started Steadfast on May 25. I was told, if there is no improvement within 25 days, I could notify the company for a full refund. I thought it was worth a try since I don't think my horse is a responder to the AAKG/J protocol (although I am using it on him) since it can't hurt. When I saw this on the DSLD group, my immediate reaction was "another magic supplement". I don't get to that group often enough and don't want Bunny and Terry to kick me off so I felt I should take my response off-list. I am so tempted at times to create and sell a silver bullet supplement - I'll mix a little poly copper and poly zinc with some selenium yeast, dry and grind up some eggshells, add a little flax and yeast as a base. Maybe I'll include some "natural" herbs. methionine support hoof integrity and at least one on joint health. Of course, I'll mention the importance of Omega-3 and use lots of relevant citations. Frequent references to "organic" and "natural", pictures of shiny well-bred working and free-roaming horses, and I'm in business. I won't have to reveal the active ingredients as they are "proprietary" - after I think of a catchy trademark name. Testimonials from a few horse owners - it should be easy to find a few copper-starved horses that will bloom when given this magical stuff. When I reviewed the website for the mentioned product, it seemed to me like an expensive form of chelated minerals and known (even if they do come from a novel source) joint supporting nutrients in a pretty "this will save your horse" package. Did this veterinarian state what the "improvements" would be? The only actual claims made on the website for Telafirm® and NEM® are reduction in arthritis-related pain - the rest is standard boilerplate related to the effects of certain minerals and nutrients in the body. Nothing is said about the amount of minerals and which ones are in the product though the implication is there that it can make up for circumstances where minerals are deficient. I even considered the possibility of Telafirm® simply being a relabeled combination of Zin-Pro minerals and selenium yeast. You can take a look at the Arenus site and decide for yourself. If you really have that kind of money to spend on silver bullets, why not try a mineral balanced diet based on hay analysis for a third of the cost and send the rest to your favorite equine research or rescue. 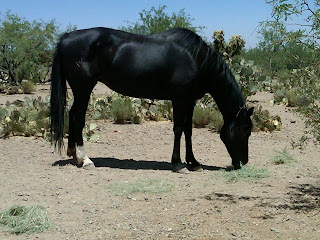 I was talking with Sheila, my equine management associate here at Desert Equine Balance, this morning when we got on the topic of "big" horses and some of the different management issues they have. Draft horses generally have been bred for strength and size rather than being mainly a refined version of a more naturally evolved light horse. They were bred for heavy work on a regular basis - pulling or carrying heavy loads - and weren't really expected to jump things or carry us on adventures around the countryside. The appeal of these large purebred drafts and draft crosses can't be denied. For the most part they seem laid back, willing to please and are beautiful to look at. 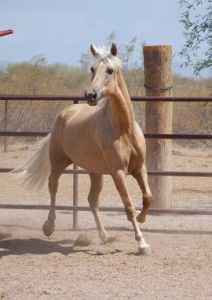 As more and more draft crosses show up at rescues, more people make the decision to bring one home as their primary riding horse. I find I'm working with more and more of these horses as time goes on and some owners find themselves with big horses that just aren't doing as well as they should. Draft and draft crosses are susceptible to a condition called EPSM - Equine Polysaccharide Storage Myopathy, a muscle condition that causes weakness and a specific type of rhabdomyolysis - known as "Sunday Morning Disease" to working draft horse owners. Some new large horse owners have heard that drafts may have special needs or requirements and spent time preparing for their "gentle giant". They can be prone to insulin resistance (IR) and poor performance related to stiffness and gait abnormalities related to the EPSM. Obesity is sometimes not "noticed" because of their large size. 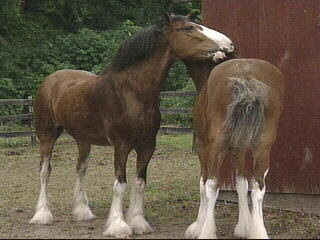 Compare the large yet fit Clydesdales above to the fat workhorse here - http://www.flickr.com/photos/78953809@N00/1688846112/. Some draft/draft cross owners have told me "my horse doesn't have EPSM". It's possible that the question isn't "if" the horse has EPSM but "when" it might show up. But with appropriate nutrition and management, the effects of EPSM don't have to affect your large horse. Monitor your big horse's weight and condition frequently. http://www.draftresource.com/Draft_Wt_Tape.html has an interesting discussion on measuring for weight; useful as most weight tapes don't go around. Avoid grain unless your horse is working hard. Use NRC guidelines to avoid over feeding your draft horse. Exercise your draft horse every day. Owners on the ESPM group report seeing more symptoms when they skip exercise. "Turnout" does not have the same effect as structured exercise. Learn all you can about diet, EPSM and caring for draft horses. EPSM: List for owners of horses with EPSM, a common problem of big horses. Lots of information from owners of big horses who have or want to prevent problems. Eleanor Kellon, VMD is a frequent visitor here and works with list members on diet and supplements. Many owners have been using a low sugar/low starch diet along with ALCAR (Acetyl L-carnitine or plain L-carnitine) and other supplements to effectively manage EPSM symptoms. Lots of background on draft horses. Dr. Valentine is an advocate of a high fat diet for draft horses. Information on both genetic testing and muscle biopsy, plus a "decision tree". PSSM is similar to EPSM, seen most often in Quarter Horses but also in draft horses and other breeds. NRC Plus - online nutrition courses by Eleanor Kellon, VMD. NRC Plus is the basic and gives the framework for the advanced courses that follow. Probiotics - Do We Need Them? I want to know what everyone is using for probiotics - and didnt you tell me once you could just add some yogurt to their feed? Wouldnt this be a different kind of bacteria than a horse would normally get? The following quote is from Dr. Kellon's Nutrition as Therapy course. There's an entire chapter on probiotics/prebiotics which I can't reproduce here. Easily fermentable prebiotic foods for the hindgut organisms, like beet pulp or psyllium. If populations may be low (older horses, horses with diarrhea,horses with a chronic history of bloating/hay belly) and use a high potency probiotic like Equine Generator from www.bio-vet.com, or start with a human high potency acidophilus only product (acidophilus is one species of Lactobacillus.)" Scott Weese, DVM, is an expert in diseases of the equine GI tract. His paper on probiotics can be accessed on IVIS at http://www.ivis.org/proceedings/AAEP/2001/91010100027.pdf. (If you're not already a member at IVIS, go ahead and join - it is free and a valuable source of international veterinary information). Because of the paucity of actual research about probiotics, when I first read Dr. Weese's paper I checked out yogurt (yoghurt) as a possible source of microbes for our horses. The "requirement" for a manufacturer to use the "live and active cultures" logo is 100 million per gram at time of manufacture; Mountain High yoghurt, for example, promotes "An 8-ounce serving of Mountain High Yoghurt contains more than 22 billion cultures at the time of manufacture." The recommended minimum dose for horses is 10 billion CFU (cultures or "colony forming units")/day. So, IMO, it would probably be sufficient to use yogurt (a quality brand like Mountain High, Dannon or a good organic or home made) for the occasional need to boost gut microbes, such as after worming or a normal course of antibiotics. Probiotics usually shouldn't be needed on a daily basis. Once an ill horse is recovered, or a stressed horse is back to their regular routine, a few days or a week's dosing should get their gut flora going. The main exceptions would be a horse with high carbs in their diet – usually from grain or pre-mixed feeds - which spill over into their hind gut, or a horse with chronic diarrhea (and cultures should be done here to help determine the cause). Some older horses with chronic digestive problems may also benefit. Then it makes sense to use a quality probiotic for simplicity, along with a pre-biotic, which provides "food" for the gut flora. But for most healthy horses, daily probiotics are probably an unnecessary expense (which could be better spent on testing hay). Check labels to make sure the product is supplying at least 10 billion CFU per SERVING. Ex: the DFM EQ provides 200 billion CFU per ounce, but the serving size is 1 scoop, which is 5 grams or 1/5th ounce; this still provides 35 billion CFU per serving which is fine. The DFM ProLactic from HorseTech is on the low side (2 billion CFU), as are most levels added to feeds or supplements. There’s a complete listing of probiotic products in Dr. Kellon’s Horse Journal Guide to Equine Supplements and Nutraceuticals.